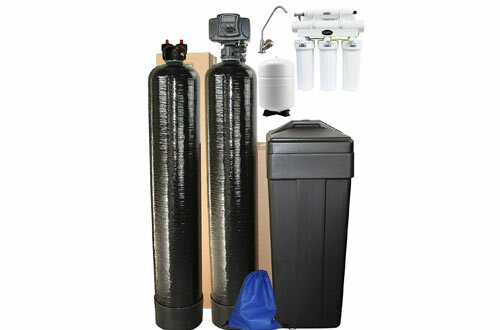 Top on our list is the outstanding Fleck 5600SXT Triple Combo Water Softener System perfect for a household of 5 people. It is a complete water system exclusive to ABCwaters and boasts several robust features required to treat your entire home. Featuring a 48,000-grain type system, this unit will treat flow rates of up to 12GPM or even hit 28GPM at peak levels. 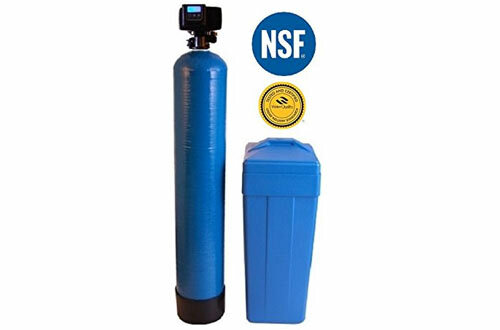 Built to ABCwater Proprietary Testing Standards, this water softener has a higher efficiency ratio of close to 1:1, thanks to the super green Osmosis system. 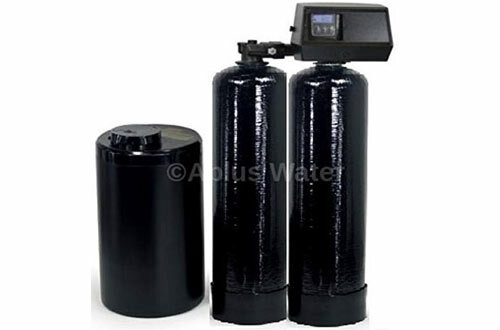 Moreover, it has dual carbon filtration, post GAC filter, 1-micron sediment filtration, and the Upgraded 75GPD Pentair Membrane for reverse osmosis. 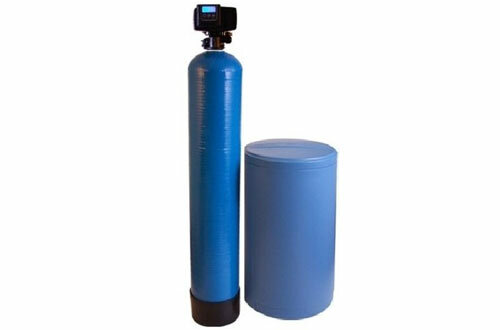 Overall, it is the best solution when you are handling medium to very hard water. This is another incredible superior unit that you won’t regret investing in. Engineered to offer advanced water softening and filtration, Acquios Whole House System boasts state-of-the-art technology y employing food-grade polyphosphate to reduce the damage caused by hard water. We all know the mess that comes with fast-accumulating scale deposits. 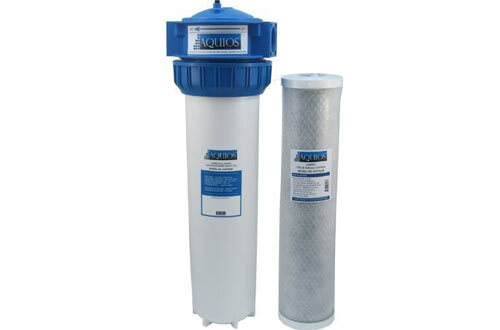 Fortunately, Acquios Whole House Jumbo Filter/Softener System greatly reduces scale deposits and even clears away existing ones. Even better is the 4.5-inch cartridge that can be used with most large diameter housings. With a capacity of treating up to 60, 000 water gallons, this unit makes the perfect choice for both small commercial facilities and larger residential homes. 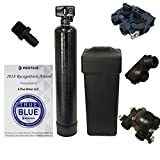 If you want a reliable water softener system that won’t eat up your entire space, consider investing in the New Fleck 9100 Twin Tank Mini Compact Water Softener. It is a normal unit that boasts twin tank design ensuring availability of clean soft water 24/7. 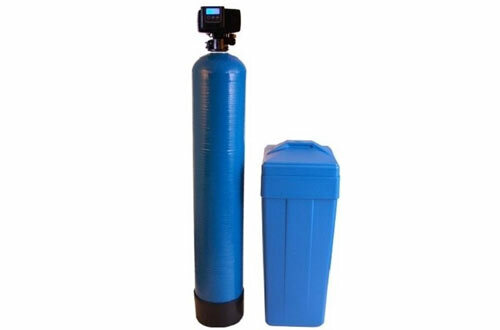 The most impressive aspect of this water filtering/softening system is the backup tank that ensures your entire household never lacks water. Equipped with a 25cubic feet of 8,000-grain resin tank, Fleck 9100 SXT works like charm despite featuring a compact design. Per backwash, this system requires 3lbs of salt and 12 water gallons. Budget-friendly, reliable and compact design best defines the New Flack 9100 SXT Water Softener. It is a complete water softening system that features 32000 grains per tank and has a twin tank delivering soft water 24/7. An upgraded paddle wheel meter is included but you can also opt for a turbine meter depending on personal preference. The 10×40″ Almond Mineral Tank feature a space-saving design. Installation is quick and pretty simple, it only lasts a couple of hours. A free bypass integrates a male threaded yoke to help with installation. An iron hardness Plus Kit is also included. When you want to have soft water 24/7 while saving on both salt and water, this unit is highly recommended. 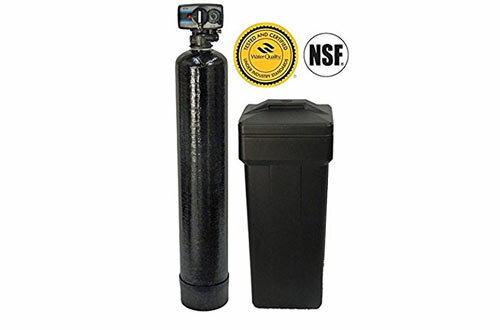 If you are looking for a stable supply of soft water that will help cut costs on water, heating bills and even reduce soap and detergent usage, try out the Fleck 5600 SXT Water Softener. With an approximate grain capacity of 80, 000, this unit boasts cleaning flow rates of up to 12GPM. Do not let nuisance minerals such as calcium, magnesium or iron decrease the life expectancy of your appliances, Fleck 5600 SXT Series is pretty solid when it comes to filtration and softening of hard water. Most impressive, this model features “ON Demand” control valve that accurately determines when your system needs to regenerate the resin. Just like other FLECK models, it comes with a free bypass integrated with a male threaded yoke to ease installation. This unit comes with a paddle wheel and a turbine meter but users can install more advanced meters as they please. Another pretty decent system that will guarantee your entire household unending flow of soft water is the Complete Fleck 5600 SXT DuraWater Model. With a high capacity water softener resin, this unit will get rid of all scale buildup and minimize soap wastage. The 5600SXT metered digital control valve achieves a higher level of efficiency. Another adorable aspect of this softener is that it is metered and doesn’t backwash greatly saving on both salt and water. It includes a standard paddle wheel and a turbine meter-note though you can use advanced meters. The blue mineral tank measures 48 inches in height and boasts a space-saving design. Free bypass features a male threaded yoke for easy installation. 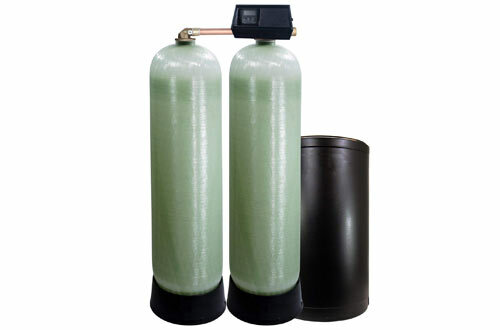 If you after a complete water solution system, consider the US-Made Iron Pro 2 Fleck 5600SXT Water Softener System. It is an advanced model that will remove iron, manganese, rust among other impurities leaving you with an unending flow of soft water. Boasting a superior Fleck 5600SXT Digital Controller, this unit is more efficient compared to its competitors and can tackle up to 14GPM. More impressive is the meter-based regeneration process that ensures no water is wasted. To help with installation and connection, a Bypass valve with 1” connection is included. Not to forget, the prominent LCD display keeps the user updated of the current system status. No household would fall short of a stable supply of soft water with this 48, 000-grain capacity water softener system. Overall, it is a great choice for any household. Using an ion exchange technology, the Fleck 5600 Econominder Water Softener System is another top-rated unit worth considering. With a capacity of 48, 000 grain, this is a high-capacity water softening system. Do not wait any longer, hard water is not good for your appliances or plumbing. Most adorable is the Fleck 5600 Mechanical Metered Control Valve that achieves a higher efficiency level of water softening. Being metered, this unit will only regenerate when there is a need, thus saving on both water and salt. The standard brine tank has a higher salt capacity of 250lbs suitable for higher hard water elimination needs. To prevent messy occurrences, this unit features a safety float and an overflow drain. The 5-year valve warranty is a solid guarantee of reliable performance and a longer lifespan. The perfect combination of an all-in-one water softening and an excellent iron filtration system. With a high-quality fine mesh resin tank and a high capacity of 48, 000 grain, this unit makes a great addition to any household. It is capable of treating up to 14GPM and lasts much longer compared to standard models. Do not take chances, scale buildup and staining can be easily be avoided. Apart from filtering dust among other impurities, this system also eliminates ferrous iron from water protecting your appliances. It boasts the Fleck 5600SXR Digital Metered Valve to boost efficiency and reduce wastage. DIY video instructions are included to help with the installation which lasts about an hour or two. 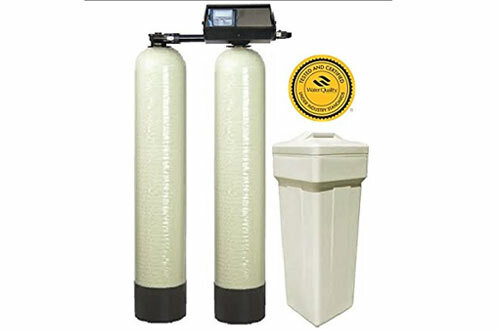 When you have a water crisis, the Abundant Water Softener 91SXT is a great choice for your household. Going down with dual alternating capacity and a grain capacity of 64K, you can never underestimate the potential of this system. It features 2ft of high-capacity resin per tank and can treat a flow rate of up to 16GPM. Moreover, the LCD Display and the touchpad controls make your interaction easy. To help conserve both salt and water, this complete system boasts the added control-on demand flow meter. Expect high-end efficiency with the Fleck 9100SXT Digital Control Head Polymer Valve Body. The ion exchange process completely hard water-causing ions leaving you with soft water that utilizes less soap and won’t cause scale buildup. Simple and easy-to-follow DIY instructions are included to help you set up the entire system.